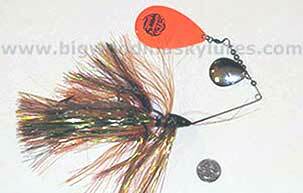 Description: The Cyco Spinner, by Musky Mayhem has colorful flashabou skirts, #6 Colorado blade and a giant #10 Colorado blade for maximum flash and water displacement. The "Cyco Spinner" has a large profile with more vibration than most crankbaits. 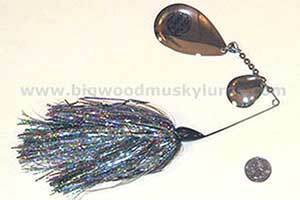 The Muskies and Northern Pike will be able to find this spinnerbait in any color of water. 9", 1 3/4 OZ.